Is hinged-raise the Club Protector to remove a club from the bag, lower the Club Protector for the club protection. Can be secured out of the way in the "up' position with straps. Perfect application for fleets because in most cases cover can be transferred from one cart to another. 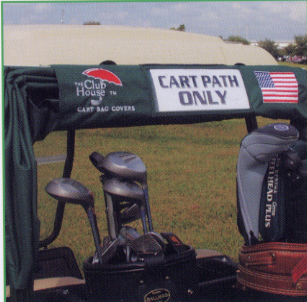 Place advertising, sponsor name, or course instructions/rules into clear vinyl panel for all to view. 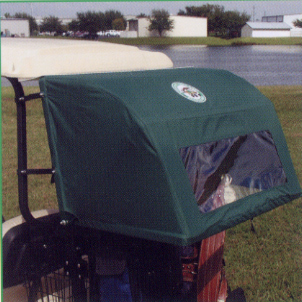 Viewing panel measures 4 1/4" x 11"
In the "down" position, golf clubs are protected from the weather. 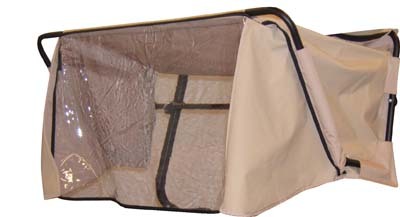 Aluminum frame is covered with "all weather polyester fabric. Brackets and fasteners are stainless steel. Mounting brackets are cart specific. Economy Club Protector, nylon top and clear vinyl rear window. 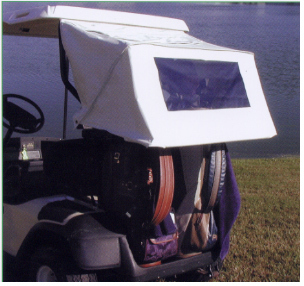 Innovative attachment system fits any golf car with a roof without drilling. Easily available-simply pull down or retract up and out of your way. Rugged fabric won't shrink or stretch. UV, mildew resistant. Beige.